On March 7, 1850, Daniel Webster delivered the last great speech of his distinguished career in defense of the Compromise of 1850. By historical coincidence, a future orator-statesman, Champ Clark, was born on that day in a poor cabin outside of Lawrenceburg, Kentucky. 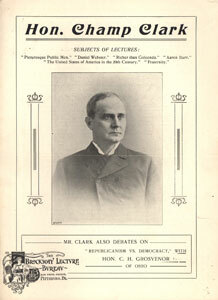 Missouri congressman, House minority leader, Speaker of the House, and unsuccessful Democratic Party presidential candidate, Champ Clark was a political leader during the Progressive Era. Like Daniel Webster, Clark’s oratorical skills furthered his career; like Webster, despite his party leadership, no major legislation bears his name; like Webster, the presidency eluded Clark. Unlike Senator Daniel Webster, Champ Clark’s political arena was the House of Representatives, where he led the Democrats in the 1910 fight to reduce the power of Speaker Joseph Cannon, and, as Speaker, inaugurated a series of democratic reforms. 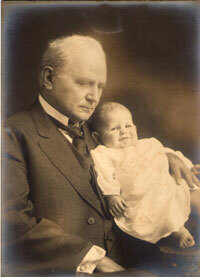 Champ Clark with his grandson Champy, whose death in 1919 devastated Champ. He married Genevieve Davis Bennett in 1881. The couple had four children. Champ and Anne Hamilton were both born and died in the 1880’s. Their surviving children were Bennett Champ, born in 1890, and Genevieve, born in 1894. This last child, Genevieve Clark Thompson, recalled in 1970 that her father was a reserved man who was not demonstrably affectionate. (2) But the written word freed the congressman of his inhibitions. “My Sweet Genevieve, My Dear Wife” became the salutation for several hundred letters to his wife of thirty-nine years. After delivering a successful speech at Tammany Hall in 1893, Clark wrote that he had fought hard to succeed for his family. “…You and our dear little boy are always first in my thoughts…”(3) “I think of those babies every day of my life,” the Speaker wrote in 1913 to a friend, Nim Long, about the deceased Champ and Anne. (4) When he traveled the Chautauqua circuit, Clark sent daily cards and letters to Bennett and Genevieve as they were growing up. “…you know now or will know in the coming years how much I love you,” he wrote to the three year old Bennett. (5) “Kiss Middy for me,” he wrote frequently to his “dear Bab” (6). Clark’s correspondence with Bennett, while the younger man was in France during World War I, provides a poignant insight into the intense love between the two men (7). And when Genevieve’s only child, Champy, died of pneumonia in 1919, “my father quit living …”(8). The Clarks were a politically powerful Missouri family well into the twentieth century. Mrs. Clark, a graduate of the University of Missouri and teacher in Louisiana, Missouri, when Clark met her, became engrossed in his political career. She campaigned with Champ and was active in the congressional wives’ club and the women’s suffrage movement. In the 1930s, she encouraged Bennett’s career in the U.S. Senate, where he carried on his father’s political legacy of fiscal conservatism and isolationism. His sister, Genevieve, also campaigned for Bennett. She and her husband, James M. Thomson, publisher and editor of the New Orleans Item, were active in Democratic politics until their retirement in 1960. Treated as part of the family, Clarence Cannon began his career as the Speaker’s clerk and carried Clark’s memory and values throughout his own congressional career, 1923-64. In his memoirs, Clark tells about his father giving him a copy of William Wirt’s Life of Patrick Henry when he was about ten years old. “…that book determined me to be a lawyer and a congressman before I had even seen a lawyer, a law-book, a court-house, or a Congressman” (9).Although the Speaker can be accused of exaggeration in his childhood remembrance, the evidence is clear that he consciously planned a political career. Born James Beauchamp Clark, he experimented with “Jamie”, “Beauchamp” and “Beau” before settling upon “Champ” while a law student as an eye catching and easily remembered name (10). He joined the Missouri Democratic Party in 1876 and thereafter worked conscientiously to begin his “life work proper” (11) which to Champ was a seat in the U.S. House of Representatives. His goal was “…to achieve a name worthy of a place beside the best of the immortals” (12). He began his quest at the local level. Clark became a popular civic and religious leader, first in Louisiana and then in Bowling Green. In July, 1876, he was elected a member of the Louisiana Fire Company. He helped organize the Louisiana Lyceum where he enjoyed debating this kind of topic: “Affirmed: That the Whipping Post Should be Re-established as a Punishment for Petty Larceny” (13). He raised a Sunday school class for young men for the Church of the Disciples in Bowling Green and taught it throughout the 1889s (14). He was active in the Masons. Clark was engaged in Democratic politics steadily from 1876 onward. After holding local and county prosecutor positions, he was elected to a term in the state legislature in 1888. He unsuccessfully sought the Democratic nomination to the House in 1890 for Missouri’s Ninth District, but won both the nomination and the election in 1892. He failed re-election in 1894 due to the depression, but was re-elected in 1896 and in each successive election until 1920, when he lost in the post-World War I Republican landslide. Clark’s hold on the Ninth’s congressional seat was due not only to his popularity but to the gerrymandering tactics of the Democratically controlled state legislature (15). Champ Clark was a Jeffersonian and a Southern Democrat; his views on the issues reflected these biases. In 1912, he said of Jefferson, “So clear was his vision as a statesman, that after a century of legislation we have not attained his lofty standard of political conduct” (19). Clark described people in Jeffersonian terms in an 1881 address: “In the aggregate, humanity is good, noble, honest and patriotic” (20). This philosophy led to Clark’s support throughout his career of such democratic policies as the direct election of senators, the elimination of the electoral college, “… a clumsy and cumbrous nuisance” (21), and primary elections for the selection of presidential and vice-presidential candidates. The first recorded reference of his support for women’s suffrage is a journal entry in 1882: “Wrote an article for Vandalia Leader, entitled ‘Equality v Mother Wiggins’ – the latter having answered an article I had written in favor of Woman Suffrage” (22). In 1911, William Jennings Bryan accused Clark of “… yielding to the harmony argument”(23). The recently elected Speaker of the House bridled at this, as he had advocated party loyalty during his entire career. “I stand by the platform,” he declared in a House speech in 1893,”… by every jot and tittle of it; … [I]t contains the Democratic gospel pure and undefiled…” (24). When the party leadership became divided, it confused and angered the voters. Clark achieved harmony in the “Bloody Ninth” district in the 1890s. Later, as Minority Leader (1908-11;1919-21) and Speaker (1911-19), he worked to unite the urban and rural segments of the party in the House. As a loyal Democrat, he campaigned for both the conservative Grover Cleveland and the liberal Bryan in presidential races. Because the Ninth was “… the rich Mesopotamia of our western world…” (25), he was an agrarian. To help farmers, he supported the monetization of silver in the 1890s; after the turn of the century, he supported the party’s shift in position to a more flexible currency, and ultimately supported the Federal Reserve. Clark urged the reduction of tariff rates until the passage in 1913 of the Underwood-Simmons Tariff accomplished this goal. “My people cannot be protested,” he said in 1897, “because their surplus must be sold in Liverpool” (26). Farmers earned less for their produce sold abroad, but paid more at home for protected manufactured goods. Still, he modified his demand for free trade after 1904 in order to appease Democrats from industrial sates (27). Closely related to both monetary and tariff policies was Clark’s support of an income tax. Although Champ Clark proposed many bills, no legislation bears his name. He was a member of the minority for many years, and then moved beyond a committee chairmanship to the Speakership when the Democrats gained control of the House in 1911. His memoirs reveal that Clark regarded his loss of the presidential nomination as the central event of his career. (29) Historically, however, he is more significant as a congressional leader. As minority leader after 1908, he unified the rural and urban factions of the House Democrats, leading them in their opposition to the Payne-Aldrich tariff (1909) and in the removal of Speaker Joseph Cannon from the Rules Committee (1910). 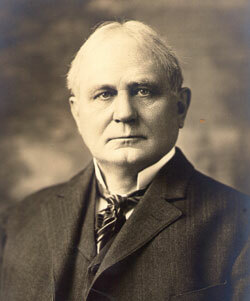 As Speaker after 1911, Clark democratized House procedures at the expense of his own power, for example by permitting a division of debate time between Democrats and Republicans. 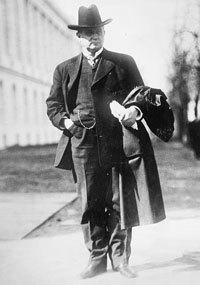 (30) He also restored the caucus, and actively led the Democratic majority in the achievement of New Freedom legislation after 1913. Declaring that he refused to be “… a rubber stamp Speaker …” (31), Clark spoke out in debate, for example, resisting the Selective Service Act, and resisting until 1917 U.S. entry into World War I. Clark’s popularity as Speaker was so great that he was re-elected in 1916 when the Republicans could have elected a Republican Speaker. Champ Clark was a colorful and significant political leader. He is the only Speaker of the House in Missouri’s history and was a major political leader during the Progressive Era. Further, he is representative of a political type at the turn of the century. Wearing a broad-brimmed slouch hat, a stand up collar, and cutaway coat, Champ Clark defended America’s farmers from industrial “plutocrats.” He was a “ring-tailed roarer” on behalf of America’s past, even as he supported such policies as women’s suffrage, the income tax, and the direct election of senators, which pushed the country into a new future. Notes: The Joint Collection of the Western Historical Manuscript Collection and the State Historical Society of Missouri Manuscripts is abbreviated in these endnotes: WHMC. In 1949 or 1950, Mrs. Genevieve Clark Thomson, Champ and Genevieve Clark’s daughter, loaned some speeches and writings by Champ Clark to Hollis White, who was completing a doctoral dissertation, “Champ Clark the Orator,” at the University of Missouri. In 1970, Professor White gave these papers to this writer. These are listed as the Hollis White Papers. Champ Clark, My Quarter Century of American Politics, 2 Vols. (New York: Harper and Brothers Publishers, 1920) I, Chapter V (hereafter Quarter Century). Genevieve Clark Thomson, informal conversation with author at her home, Balclutha, outside Berryville, Virginia, August, 1970. Champ Clark to Genevieve Clark, July 5, 1893. Clark MSS, WHMC, File 603. Champ Clark to Hon. Nim R. Long and Wife, Jan. 31, 1913. Cannon MSS, WHMC, File 6. Champ Clark to Genevieve Clark (daughter), undated, late 1890s. Clark MSS,WHMC, File 626. Wartime correspondence of Champ and Bennett Clark, 1917-1918. Clark MSS, WHMC, Files 64-68. Genevieve Clark Thomson, informal conversation with the author at her home, Balclutha, August, 1970. Champ Clark, “Journal,” March 7, 1878. Clark MSS, WHMC, file 810. “Journal,” Feb. 1, 1877. Clark MSS, WHMC, File 809. “Journal,” Jan. 25, 1878. Clark MSS, WHMC, File 810. Geoffrey F. Morrison, “A Political Biography of Champ Clark” (PhD dissertation, St. Louis University, 1971), Appendix A (hereafter “Political Biography”. Louisiana, MO Journal, March 9, 1877, WHMC. Champ Clark, “My Speech in the Case of Jerry Hill, What I Remember of It.” (hereafter “Jerry Hill”) Clark MSS, WHMC, Files 879-883. Attorney James Neville has researched the numerous literary and religious references in this unusual and fascinating speech. Neville discovered, in the course of his research, that the Missouri Supreme Court reduced Hill’s sentence to life in prison. For a more extensive account of Clark’s Chautauqua experience see “Political Biography,” 106-111 or Hollis White, “Champ Clark the Orator” (Ph.D. dissertation, University of Missouri, 1951). Champ Clark, “Champ Clark’s Speech on Thomas Jefferson,” Louisville, Kentucky, April 6, 1912. Clark MSS, Hollis White Papers, in possession of this author. Champ Clark, “The Necessity for Political Morality,” May 12, 1881. Clark MSS, Hollis White Papers, in possession of this author. Champ Clark, manuscript of an undated article. Clark MSS, Hollis White Papers, in possession of this author. “Journal,” April 29, 1882. Clark MSS, WHMC, File 812. William Jennings Bryan to Champ Clark, September 5, 1911. Bryan MSS, Library of Congress. Congressional Record, 53rd Cong., 1st Sess., August 19, 1893, 527. Congressional Record, 56th Cong., 2nd Sess., January 16, 1901, 1086. Congressional Record, 55th Cong., 1st Sess., March 25, 1897, 270. See Clark’s congressional speeches in the Congressional Record, 53rd Cong., 2nd Sess., January 15, 1894, 833; and 58th Cong., 2nd Sess., March 28, 1904, 3836. See “Political Biography,” Chapter VI, for an extensive survey of the Baltimore Convention from Clark’s perspective. New York Evening Post, June 21, 1911. Scrapbook, Underwood MSS, Montgomery, Alabama. Congressional Record, 63rd Cong., 2nd Sess., March 31, 1914, 6057. Bryan, William Jennings, Papers. Library of Congress. Clark, James Beauchamp and Bennett Champ, Papers, 1853-1973, and Cannon, Clarence (1879-1964) Papers, 1893-1964. Joint Collection University of Missouri Western Manuscript Collection – Columbia, and State Historical Society of Missouri Manuscripts, Columbia, Missouri. Clark, Champ, Papers. Loaned to Hollis White; loaned to Geoffrey Morrison. Congressional Record, 53rd through 61st congresses. Underwood, Oscar, Papers, Alabama State Archives, Montgomery, Alabama. Morrison, Geoffrey F. “A Political Biography of Champ Clark” (unpublished Ph.D. dissertation, St. Louis University, 1971).